Cat5e vs Cat6 Cable – Which do You Choose? As one type of copper cabling, twisted pair wiring is widely adopted for Ethernet networks which wraps the two conductors of a single circuit together. Nowadays, many kinds of twisted pair network cables are available in the market. To specify the cable wiring standards, the Electronic Industries Alliance (EIA) and Telecommunications Industry Association (TIA) have defined twisted pair cables into a series of categories, such as Cat5, Cat5e, Cat6, Cat6a, Cat 7, etc. This article will put emphasis on Cat5e vs Cat6 cable to see their differences and discuss which one to choose for your network applications. 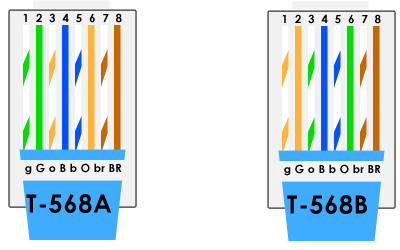 Two standards of T568A and T568B can be used to wire Cat5e and Cat6 Ethernet cable. The only difference between T568A and T568B is that the green/green strip and orange/orange strip wire positions are swapped. In general, T568B is more popular for office and commercial networks. But no matter which wiring standard you choose, the most important thing is to continue with the selected standard for consistency. The following picture shows the concrete structure of T568A and T568B wiring. Data speed is important for cable selections. You have to choose the cable that is equivalent to what is running on it. As for Cat5e patch cable, it can support 1 Gigabit Ethernet. While Cat6 cable can support a higher data rate of 10 Gigabit Ethernet. This is because Cat6 cable performs up to 250 MHz, which is more than twice that of Cat5e cable with 100 MHz. 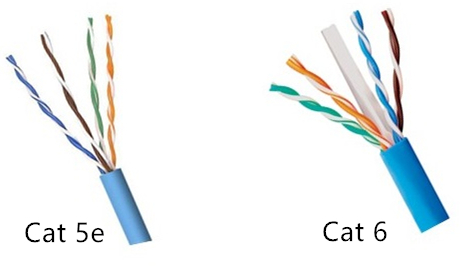 The common ground of Cat5e vs Cat6 cables is that they are all designed for short distance data transmission because they are made of copper wires. If the cable is used for lower data rate transfer, both Cat5e and Cat6 are able to reach the maximum length of 100 meters. However, when the data rate achieves the maximum speed, the Cat5e cable can only reach 50 meters and Cat6 with 37 meters. Compared with Cat5e cables, the cost of Cat6 cables is typically 10 to 20% more expensive because of the higher transmission speed. But the price of these cables is comparatively cheap, which only takes up a small portion of the total budget. For the consideration of your application, Cat6 might be a better choice if a higher data rate is required. The additional cost can save you more money in the long run. Traditionally, Cat5e cable is run for the business telephones. But using Cat6 cable with a phone might be a waste. Cat6 is suited for broadband video and digital video applications because of the lower signal losses and better transmission performance at higher frequencies compared with Cat5e. Can We Use Cat5e With Cat6 Cable? The answer is yes. Regardless of a possibly different coating on the pins, Cat5e and Cat6 are both employing the RJ45 plug standard which makes them compatible with each other. But you can only receive a limited speed of the lowest link in the chain. Therefore, if you want to receive the best performance of cables, you should better use the matching components for your application. As regard with Cat5e vs Cat6 cable, they are two different categories of twisted pair cabling. The major difference between them is the data speed. Cat6 has a higher speed than Cat5e which accordingly varies its maximum length, cost, and application. All these factors are important for you to make a choice between Cat5e and Cat6. Moreover, if a higher speed over long distance is demanded, fiber optic cables might be a better solution. Even in the age of WiFi and high speed cellular networks, we still need networking cables to together our computing hardware together. Both Ethernet cables and fiber optic cables are used to deliver and distribute communications. Offering a fast, secure and reliable connection, these cables play different roles in delivering critical entertainment and business data. Originally developed by Xerox in the 1970s, Category 5 and 6 cables, or Cat 7 cable connect computers and gaming systems to routers in our homes and offices. Recognized by their large locking RJ45 plastic connectors and resembling over-sized phone wires, these cables carry data measured in the hundreds of megabits per second. These multi-conductor cables also connect routers to modems and switches, depending on a network’s configuration. Ethernet data rates vary depending on the cable used. The newest Cat 7 cable, 10 Gigabit Ethernet, transmits up to 10 Gbps. Category 7 technology improves both internal signaling and exterior shielding compared to older CAT5 / CAT5e and CAT6 cables. CAT 7 cable supports 10 Gigabit Ethernet network connections, and CAT7 cables are also compatible with standard Ethernet adapters.Gigabit Ethernet transmits up to 1 Gbps. Fast Ethernet, still the most common cable used in homes and offices today, transmits up to 100 Mbps (approximately 0.1 Gbps). Fiber optic cable’s primary claim to fame is its ability to carry vast amounts of data over considerable distances. Fiber optic wiring is normally found leading from an Internet service provider’s central distribution center to individual localized hubs in a neighborhood. Amazingly, this data is carried along glass or plastic fibers as light. Depending on whether the Internet service is DSL or cable-based, phone wires or coaxial cable then lead to each address. Fiber optic cable retrofits have enabled service providers to offer higher speeds and increased data throughput. Signals on fiber optic cables are typically repeated or boosted to compensate for signal losses over distance. At distances up to 1.86 miles, single-mode fiber-optic cable can transmit data up to 10 Gbps, but it is used primarily for video. It is used primarily for high-bandwidth video or as a backbone to connect networks between buildings. Multimode fiber, which is used for voice, data, and video, has a data rate up to 1 Gigabit per second for distances under 1.24 miles. Multifiber Push-On (“MPO”) fiber trunks (like MPO to LC cable) have become the default cabling solution to these ever-increasing data center bandwidth requirements. Because they are a natural fit for parallel optics, these fiber links are compact, pre-terminated, able to handle bandwidth all the way up to 100 Gbps, and even plug and play by design. People always think fiber optic cable would beat copper Ethernet cable hands down. However, cable manufacturers have continued to update the technology behind Ethernet, meaning it can be just as fast as some fiber optic cables today. For example, Cat 7 cable is a next-generation standard cabling technology transmits up to 10 Gbps. While Ethernet cable and fiber optic cable are completely different, fiber optic cable can be used in Ethernet networks. Ehernet cable price and fiber optic cable price are also not the same, choosing Ethernet cable or fiber optic cable you should take it into consideration. Size and weight factors are always needed to be taken into consideration when preparing for a cable plant installation. Fiber optic cables are now running existing conduits or raceways that are partially or almost completely filled with copper cable. This is another area where small fiber optic cable has advantages over copper cable. In this article, we will do a comparison and try to determine the reduced-size and weight advantages of fiber optic cable that over copper cable. As we already know, a coated optical fiber is typically 250um in diameter. We learn that fiber optic ribbon cable sandwich up to 12 coated optical fibers between two layers of Mylar tape. Twelve of these ribbons stacked on top of each other form a cube roughly 3mm by 3mm. This cube can be placed inside a buffer and surrounded by a strength member and jacket to form a cable. The overall diameter of this cable would be only slightly larger than an RG6 coaxial cable or a bundle of four Category 5e cable. So how large would a copper cable have to be to offer the same performance as the 144 optical fiber ribbon cable? That would depend on transmission distance and the optical fiber data rate. Take Category 5E cable as an example, let’s place a bundle of Category 5e cables up against the 144 optical fiber ribbon cable operating at a modest 2.5Gbps data rate over a distance of just 100m. Now let’s see how many Category 5e cables will be required to provide the same performance as the 144 optical fiber ribbon cable. The 144 optical fiber ribbon cable has a combined data transmission rate of 360Gbps. When we divide 360Gbps by 800Mbps, we see that 450 Category 5e cables are required to equal the performance of this modest fiber-optic system. When 450 Category 5e cables are bundled together, they are roughly 5.3 inches in diameter. As noted earlier in this chapter, the 144 optical fiber ribbon cable is approximately the size of four Category 5e cables bundled together. The Category 5e bundle thus has a volume of roughly 112.5 times greater than the 144 optical fiber ribbon cable. In other words, Category 5e bundles need 112.5 times more space in the conduit than the 144 optical fiber ribbon cable. This comparison we just made is very conservative. This distance we used was kept very short and the transmission rate for the optical fiber was kept low. We can get even a better appreciation for the cable size reduction fiber optic cable offers if we increase the transmission distance and the data rate. In this comparison, let’s increase the transmission distance to 1,000m and the data transmission rate to 10Gbps. The bandwidth of a copper cable decreases as distance increases, just as with fiber-optic cables. Because we have increased the transmission distance by a factor of 10, it’s fair to say that the Category 5e cable bandwidth will decrease by a factor of 10 over 1000m. With a reduction in bandwidth by a factor of 10, we will need ten times more Category 5e cables to equal the old 2.5Gbps performance. In other words, we need 4,500 Category 5e cables bundled together. In this comparison, however, the bandwidth has been increased from 2.5Gbp to 10Gbps. This means we have to quadruple the number of Category 5e cables to meet the ban width requirement. We now need 18,000 Category 5e cables bundled together. Imagine how many cables we would need if the transmission distance increased to 80,000m. We would need whopping 1,440,000 Category 5e cables bundled together. These comparisons vividly illustrate the size advantages of fiber optic cable that has over copper per cables. The advantage becomes even more apparent as distances increase. The enormous capacity of such as small cable is exactly what is needed to install high-bandwidth systems in buildings where the conduits and raceways are almost fully populated with copper cables. Now we have calculated the size advantages of fiber optic cable over Cat5e cable. Let’s look at the weight advantages of fiber optic cable. It is pretty easy to see that thousands, tens of thousands, or millions of Cat5e cable bundled together will outweigh a ribbon fiber optic cable roughly one half of an inch in diameter. It’s difficult to state exactly how much less a fiber optic cable would weigh than a copper cable performing the same job – these are just too many variables in transmission distance and data rate. However, it’s not difficult to imagine the weight savings that fiber-optic cables offer over copper cables. These weight savings are being employed in commercial aircraft, military aircraft, and the automotive industries, just to mention a few. From the above, we have learned the size and weight advantages of fibre optic cable. FS, a reliable provider of networking equipment, offers a comprehensive line of fiber optic cables and Ethernet cables. Any queation about cabling, please contact us via sales@fs.com. Fiber optic cabling consists of strands of purified glass, or even plastic, rods that conduct specific wavelengths of light, analogous to the electrons carried along a Copper Ethernet Cable. However, light traveling through glass or plastic is not susceptible to the same problems that metal conductors are; The electromagnetic radiation that results from current traveling through a wire is not present in optical conductors, and optical conductors can be made much smaller than metal ones. Today, we’ll talk about the advantages and disadvantages of fiber optic cable. Everything has its own advantages and disadvantages. Learning the advantages and disadvantages of fiber optic cable, we may know how to select one when buying the cables. 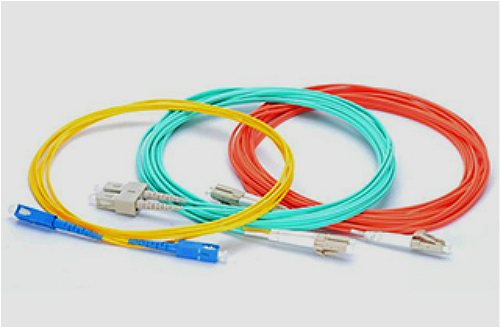 All copper cable network media sharing a common problem: they are susceptible to electromagnetic interference (EMI), fiber optic cabling is immune to crosstalk because optical fiber does not conduct electricity and uses light signals in a glass fiber, rather than electrical signals along a metallic conductor to transmit data. So it cannot produce a magnetic field and thus is immune to EMI. Because light is immune to interference, can be modulated at very high frequencies, and travels almost instantaneously to its destination, much higher data rates are possible with fiber optic cabling technologies than with traditional copper systems. Data rates far exceeding the gigabit per second (Gbps) range and higher are possible, and the latest IEEE standards body is working on 100Gbps fiber based applications over much longer distances than copper cabling. Multimode is preferred fiber optic type for 100-550 meters seen in LAN network, and since single mode fiber optic cables are capable of transmitting at these multi-gigabit data rates over very long distances, they are the preferred media for transcontinental and oceanic applications. Typical copper media data transmission by the distance limits the maximum length of less than 100 meters. Because they do not suffer from the electromagnetic interference problems of traditional copper cabling and because they do not use electrical signals that can dramatically reduce the long distance, single-mode fiber optic cables can span 75 kilometers (about 46.6 miles) without using signal-boosting repeaters. The Copper cable transmission media is susceptible to eavesdropping through taps. A tap (short for wiretap) is a device that punctures through the outer jacket of a copper cable and touches the inner conductor. The tap intercepts signals sent on a LAN and sends them to another (unwanted) location. Electromagnetic (EM) taps are similar devices, but rather than puncturing the cable,they use the cable’s magnetic fields, which are similar to the pattern of electrical signals. Because fiber optic cabling uses light instead of electrical signals, it is immune to most types of eavesdropping. Traditional taps won’t work because any intrusion on the cable will cause the light to be blocked and the connection simply won’t function. EM taps won’t work because no magnetic field is generated. Because of its immunity to traditional eavesdropping tactics, fiber optic cabling is used in networks that must remain secure, such as government and research networks. The higher cost of fiber optic cabling has little to do with the cable these days. Increases in available fiber optic cable manufacturing capacity have lowered cable prices to levels comparable to high end UTP on a per-foot basis, and the cables are no harder to pull. Ethernet hubs, switches, routers, NICs, and patch cords for UTP are very inexpensive. A high quality UTP-based 10/100/1000 auto-sensing Ethernet NIC for a PC can be purchased for less than $25. A fiber optic NIC for a PC costs at least four times as much. Similar price differences exist for hubs, routers, and switches. For an IT manager who has several hundred workstations to deploy and support, that translates to megabucks and keeps UTP a viable solution. The cost of network electronics keeps the total system cost of fiber-based networks higher than UTP, and ultimately, it is preventing a mass stampede to fiber-to-the-desk. The other main disadvantage of fiber optic cabling is that it can be more difficult to install. Ethernet cable ends simply need a mechanical connection, and those connections don’t have to be perfect. Fiber optic cable can be much trickier to make connections for mainly because of the nature of the glass or plastic core of the fiber cable. When you cut or cleave (in fiber optic terms) the fiber, the unpolished end consists of an irregular finish of glass that diffuses the light signal and prevents it form guiding into the receiver correctly. The end of the fiber must be polished and a special polishing tools to make it perfectly flat so that the light will shine through correctly. From the above, we have learnt the advantages and disadvantages of fiber optic cable. Knowing the advantages and disadvantages of fiber optic cable can help us to choose a suitable fiber cable. For more details about fiber cables, please visit FS.COM.